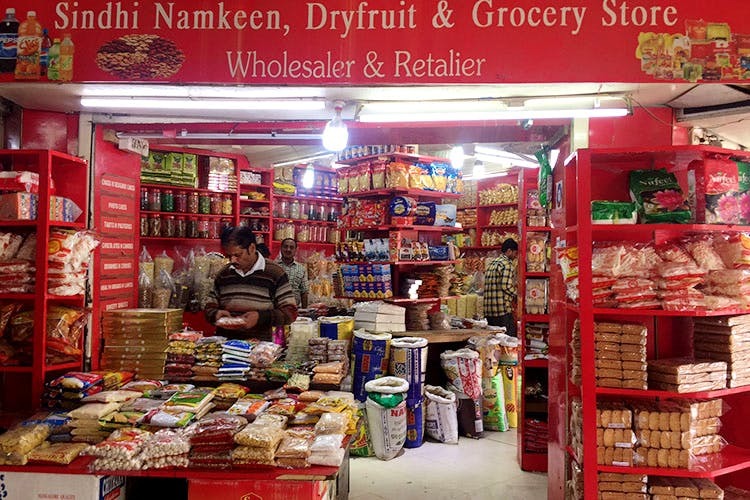 Sindhi Namkeen is the one place you need to know for snacks, papads, namkeens, seeds, chips, dry fruit, soya chaap and all sorts of savoury goodies at wholesale prices. Do You Even Sindhi, Bro? If you haven’t heard of Sindhi Namkeen, it’s probably because you live under a rock; there is a Sindhi Namkeen store in every self respecting market complex. Are they all the same? Urban legend has it, and the gentleman at this particular Sindhi Namkeen confirmed, that they are all spread out under one family tree. The owner might not be the same guy, but each outlet belongs to the chachas, bhaiyas and other uncle varieties of this family tree. True to its name, Sindhi Namkeen has pretty much all varieties of namkeen under one roof. What it also has is all varieties of nuts and seeds, chia, flaxseed, sunflower seeds, pine nuts, raisins, figs, almonds, and walnuts. Remember those orange and cola hard candies sold back in the day? The ones most of our parents didn’t allow us to eat? Well, you can have them now because you get them at Sindhi Namkeen, hygienically packed so your parents won’t frown. We kinda love everything and will be pretty much making monthly visits to refill our namkeen and dry fruit stocks. But no trip to Sindhi Namkeen is complete without picking up some of their digestive churan and aam papad. Yes, we almost forgot this very key piece of information, they sell FRYUMS! Gosh, major throwback feels. Netflix and Fryums anyone?